One of the most important skills students will need for fifth grade math is automatic recall of addition, subtraction, multiplication, and division facts. 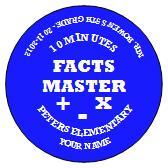 I strongly encourage all students to practice math facts at home for at least 5 minutes each night. Our class will be charting progress as we take Facts Master practice tests each week, with the goal of correctly answering all 300 problems in under 10 minutes. **Please note that these practice tests are NOT graded (except as completion assignments) and are not required to be timed. Students are typically given the Facts Master page on Monday and are encouraged to work on completing the page throughout the week. Multiplication.com Tests - Practice addition, subtraction, multiplication, and division facts with these timed tests. XtraMath - Targeted facts practice. Login using username/password given in class. Mastering Math Facts - Strategies to learn multiplication facts.